My Friend Cayla is not an ordinary Doll. She is a smart doll that connects via Bluetooth enable and has access to answer over 1000 questions, spell words, play games, tell stories and interact with a child. Cayla has beautiful long blond hair and dressed as a real toddler girl. Her loving smile will warm up into any child's arms. She stands 18" and can sit and stand. 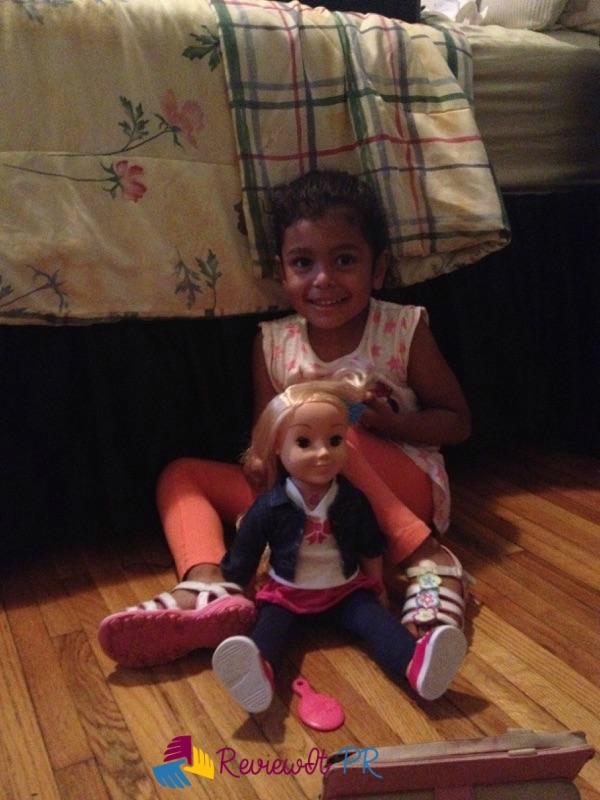 Ashley has fun interacting, brushing and playing with Cayla. We gave Cayla to Ashley as a Birthday gift and loved it! It's really a great way to keep Ashley occupied with her time. She is learning words and repeat words Cayla says. We will continue Ashley to interact with Cayla for more fun and learning experience. Cayla requires three AA batteries. After you got the batteries inside just download My Friend Cayla's app and follow the steps. When everything is setup enjoy interacting with her. It's a great toy for a child to talk and get a response back. 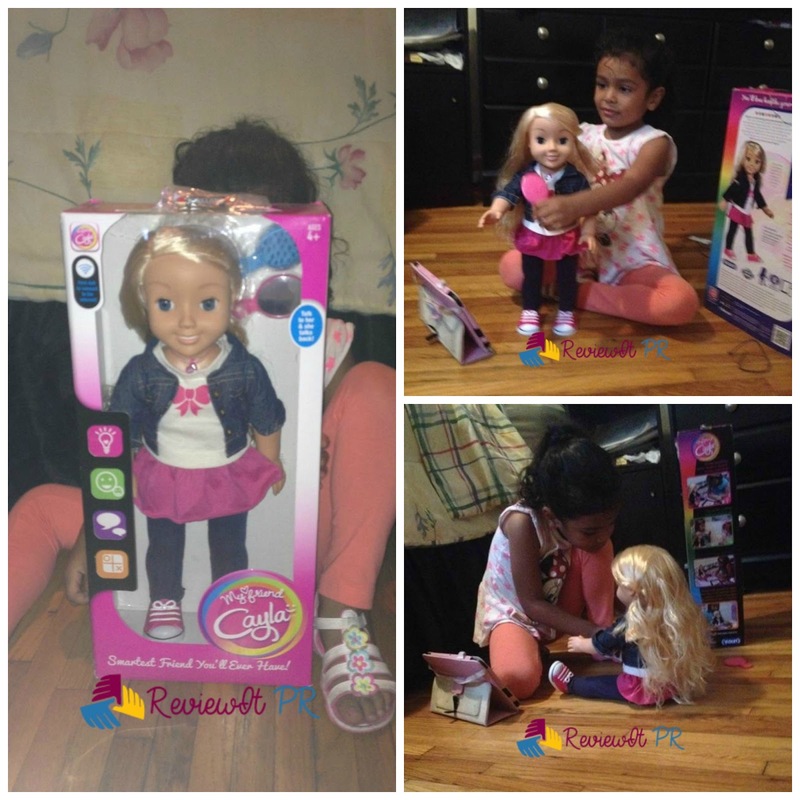 A child will have a lot of fun because Cayla can interact like no other doll! She has so many features and comes with a mirror and brush for more added play. Cayla will be any child's best friend. The fun will never end! My Friend Cayla is a great doll. Find out what other offers My Friend Cayla has follow them on Twitter and like them on Facebook. Want to purchase a My Friend Cayla for your child or as a gift visit http://www.myfriendcayla.com. Cayla is such a pretty doll. I love that she's smart and I'm sure learning will be fun and easy with her. Wow...the fact that this doll can answer over 1000 questions is amazing. It's really cool how far dolls and toys overall have become advanced in technology over the decades. My friend Cayla is so pretty! I think it's really cool that she's an interactive doll! How unique! This is a fun twist with a doll since most of them can't interact. Cute! H-O-L-Y Cow! Any day now I expect my daughter will hear about this and start asking for one. They sure don't make them like they did when I was a kid! I love dolls and I am very much interested in collecting different variety of dolls since my childhood. This Cayla doll looks so pretty and cute. I really need this one for my girls too. What a cute doll. I will have to get one for my niece since I only have boys.